For 5 generations on this wine-growing estate, our family renovated this wine-grower’s house while preserving its soul. It is for us an opportunity to share our passions: wine for Nicole and bovine breeding for Hervé We will be delighted to make you taste our produce during your stay. By renovating this house, we wanted to make it practical, warm, easy to maintain and safe for children while preserving its charm. You must cross the wine-growing property to access the gîte and follow a 200-metre-long path. 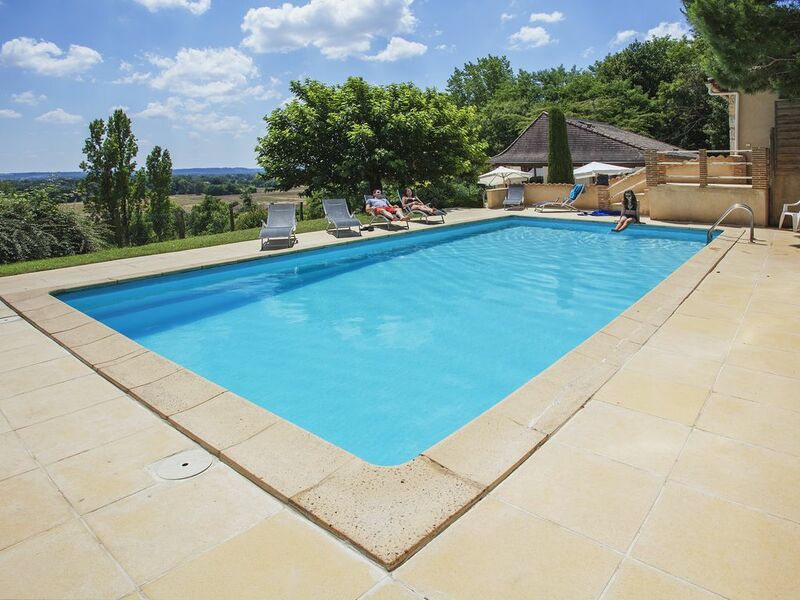 You will then be home, in the middle of vineyards and meadow, not overlooked, no neighbours, no intruders, only pleasant views of the Dordogne Valley. The 4.5 m² shower room of the house offers a shower, a washbasin, a washing machine, a hair dryer, an extra electric heater, an iron and an ironing board. The toilet is separate. The 1 in the outbuilding has a toilet and a shower All floors are tiled. 10x5 m fully fenced private pool: even if it is equipped with an approved alarm sound system for more safety, its access remains under the responsibility of users. The security gate that gives access to the pool is lockable. Garden furniture, barbecue, table tennis table, parasols and sunloungers are at your disposal. You can fish (gear is not provided) for free in the 2 small ponds after approval. Pets are allowed with prior agreement. Your parking is also private. AT your disposal inside the house: open fireplace, 2 televisions, video recorder, dishwasher, electric oven, refrigerator-freezer, oven, microwave, 4-ring hob, electric coffee machine, tableware and kitchen utensils. In the outbuilding, the summer kitchen has a sink, a gas hob, a washing machine, a freezer, a refrigerator, a mini oven and storage cupboards. The indoor rooms preserved their original beams. Ubicada a 1 km de un pequeño burgo con muchas tiendas, la casa está a 5 km de Bergerac, su aeropuerto, sus mercados (miércoles y sábado), restaurantes y cines. El castillo de Monbazillac está a 10 min en coche, la torre de Montaigne y Saint-Emilion (patrimonio múndial) a 1h, Walibi de Agen a 1h30. Está a 80 km de Sarlat (ciudad medieval) y de las cuevas de Lascaux (museos de la Prehistoria), a 100 km de Burdeos y a 150 km del mar. Está en Périgord y sus 1001 castillos. Dordoña le permite disfrutar la felicidad de piragüa, canoa, paseos en gabarra. El campo le reserva excursiones peatonales y ecuestres, golfo y tenís. Está en medio de viñas de Bergerac, en la cuna de la pequeña región con denominación Rosette dentro de una propiedad vinicol.